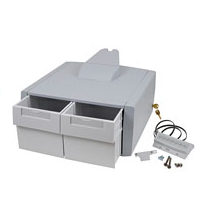 Upgrade a non-drawer powered cart for medication delivery with this drawer assembly. Double version provides two separate medium drawers. This drawer works in conjunction with the cart’s electronic auto-locking drawer system.